The working principle of a heat pump is basically identical to that of an everyday appliance known to all of us: the refrigerator. However, while the refrigerator removes heat from its interior and gives it off to the environment, the heat pump removes heat from the exterior (air, soil, etc.) and gives it off to the house as heating energy. Thus, the system works exactly in reverse. 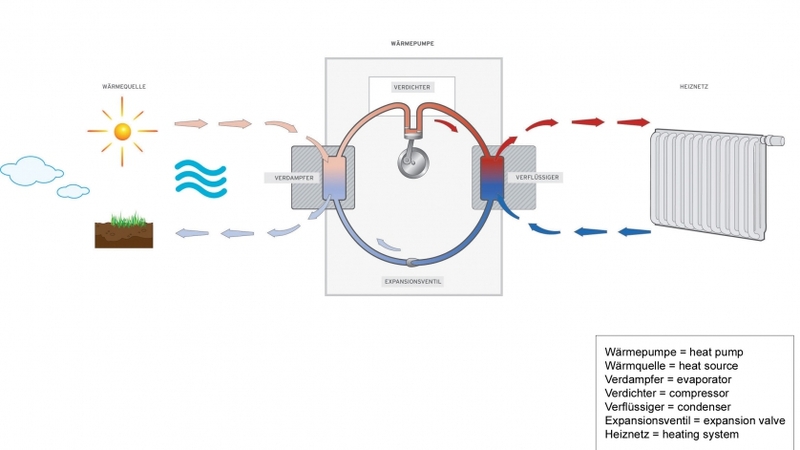 In order to do that the heat pump performs a compression of a gas (as in the refrigerator) and thus liberates the heat previously removed from the environment by evaporation. This process also consumes energy and must therefore be carefully controlled. If the compression or evaporation temperature is controlled very accurately in a heat pump system via the pressure, this allows to save energy costs and thus also protect the environment. WIKA offers products especially for application in heat pumps, the pressure transmitter R-1. What does “adiabatic compression” mean and what is a pressure-surge test?